I am not getting paid to endorse this product! I will always tell you if I am! I truly do use and love this pillow! Shoulder and Neck Pain: From sleeping in incorrect alignment. pinching nerves, pulling muscles. Arms: Awkward feeling like you don't know what to do with them. This pillow solves all of those problems! 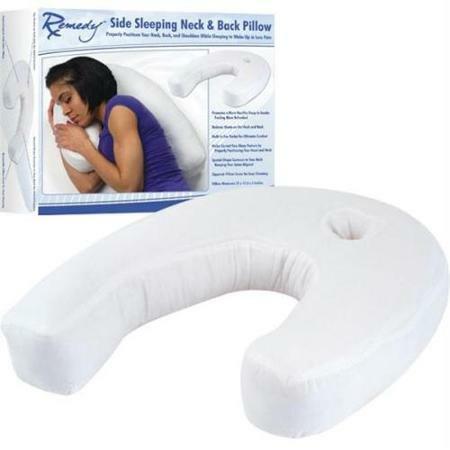 Shoulder and Neck Relief: The curved shape of this pillow is perfect to nestle your shoulder right up to the pillow. The width is perct for your head, but supports your neck and shoulder perfectly! Ear Relief: In the picture above you'll see a little circle shaped cut out. That is exactly for your ear! No more squished ear! Seriously wonderful! Arm Relief: You can easily wrap your arms around the extended sides (one side IS longer than the other) and snuggle right in with it. One extended side is longer for supporting your back, but truth be told, I flip from side to side and just use both sides of the pillow equally. It has a zipper enclosed pillow case (shown above on the pillow) that can be removed and washed! This is a prefect pillow for traveling in a car! (Once you try it you'll be fighting for a turn with it! )Just pop it across your shoulder and lean against the window, and bam! You are snoozing! This pillow can be found in lots of places. When I first bought it I got it at a Target store, when I went to replace it I found it on Walmart.com and had it shipped to my local store for pick up. In case you're pillow is so old you can't recall its unique shape, it is the ideal opportunity for another one. In any case, how would you know which is the best pillow for you? Consider how you rest. On the off chance that you spend the greater part of the night on your side, you will need to pick a firm yet soft pillow to keep your neck in accordance with your head, shoulders and spine. nice post. Thanks and keep sharing.